REV. HERMAN BAILLARGEON— In tlie dual capacity of pastor and superintendent, Father Baillargcon served the Church of St. Jean the Baptiste and St. Jean Parochial School of Troy, New York, with an earnestness, zeal and ability that has brought results most gratifying. Herman Baillargeon, son of Joseph and Amelia (Bazin) Baillargeon, was born at Quebec, Canada, June 23, 1879, and attended a private school there until his family moved to Cohoes, New York, in 1886. He then became a student at St. Joseph's Academy, later entering Levis College, at Quebec, whence he was graduated with the degree of Bachelor of Arts in 1898. Later he took two years of special work at Montreal, Canada, before entering Leval University to pursue his theological training. He was called to Albany,, New York, for ordination ceremonies and engaged there as chaplain of St. Peter's Hospital for one year thereafter. At the end of that time he was appointed assistant pastor of St. Jean the Baptiste Roman Catholic Church, in Troy, and in June, 1905, became pastor of St. Ann's Church of Cohoes, New York. 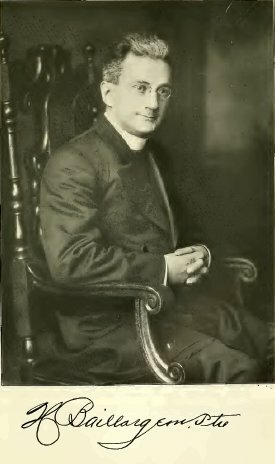 He came to the pastorate of St. Jean the Baptiste, November 5, 1915, and at the same time, assumed charge of the St. Jean Parochial School, of which he was superintendent. That school has in attendance, one hundred and thirty pupils, taught by four Sisters of the Order of St. Joseph, the curriculum covering the usual courses to the eighth grade. Rev. Herman Baillargeon, for the last eight years pastor of St. Jean Baptiste Church, to-day assumed his new duties as pastor of Notre Dame Church, Whitehall, New York, but the farewell reception he was tendered last night by his parishioners at St. Jean Baptiste Hall will serve to always keep in mind the members of St. Jean's congregation. The entire congregation turned out last night at the parish hall and Joseph L. Belanger on behalf of the people of St. Jean's, in a brief address, conveyed the feelings of the congregation on the departure of their beloved pastor, and at the conclusion presented Father Baillargeon with a purse of $600. In addition to the purse given by the congregation, Father Baillargeon was presented with a purse of $150 by the Alumni Association of St. Jean Baptiste School and another purse of $20 contributed by the school children. Benoit Spenard presented the alumni purse. When Father Baillargeon came to the local church eight years ago a debt of $45,000 was on the church property. Soon with characteristic energy, he set about to remove- the debt and through his eflforts and leadership $18,000 was raised for this purpose, leaving the present debt $27,000. Father Baillargeon in thanking his people for their gifts, expressed a feeling ofgratitude on the hearty cooperation of his parishioners, stated that he had hoped to pay off the debt on the first Sunday of November, 1928, which date marks the sixtieth anniversary of the establishment of the parish, and now that he has been assigned to a new charge, he expressed the hope that he would be present on that date and said he felt that his plans would be carried out. He urged the congregation to extend to the new pastor, Rev. Paul LeDuc who comes from St. Joseph's Church, Cohoes, the same cooperation that had been extended to him in the past.